If you have ever presented, you know this to be true: a lot of things come at you, quickly, when you are at the front of that room. To start, you are completely out of your paradigm, your normal working environment. There’s the podium to stand behind and the open stage where you can roam; your slides — always displayed behind you where you can’t see them; your notes in front of you — hopefully big enough to read; and of course, your audience, waiting on your every breath, your every motion. All eyes are on you! In a way, your presentation is a performance. People are expecting to be informed, and — yes it’s true — entertained. I’m here to tell you something you already know: being a skilled presenter is not easy. It takes preparation and practice. You have to map out a plan with a clear destination, and then present the plan so that your audience knows where they are going and are engaged on the journey there. How you present is the main reason why your audience stays engaged. Let me say that again: your presentation skills are the main reason your audience pays attention. Not your information, but your skill at presenting. In my estimation, there are 28 skills a presenter must master. You can read about them in my most recent Toward Humanity blog post, “28 Qualities of a Skillful Presenter” (or download the PDF instead). As always, I’m interested to hear what you think. I once attended a presentation on global communication. The presenter asserted that the basic method of communication among people who didn’t speak the same language and who were from different cultures was through images. One of the reasons that images are so powerful, besides that they can be universal, is that our brains tend to store images in only a few places. In fact, similar images are faithfully stored in the same places in our brains. Contrast that with words. First off, letterforms are graphical, although they are not perceived graphically. Words are read as concepts. Thus, we tend to store words in widely different places in our brains. As a result, the concepts communicated through images — especially metaphorical concepts — are more enduring. Because of this, I use images in these newsletters as metaphors. Take the image in this issue for example. 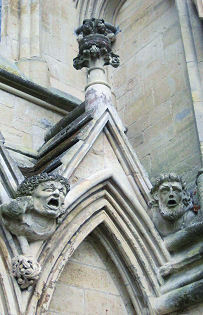 This sculpture of the two heads appears on the exterior of the Salisbury Cathedral in England. The image in this month’s blog entry — the brick wall outside Abbey Road Studio in London — is laden with graffiti directed at the Beatles. I chose each of these images for their metaphorical messages. Care to guess why? Tell me what you think.